The Hebrew word makhtesh is the word used for a geological formation that is unique to this area, formed when a river hollows out a mountain. This photo was shot from inside and shows the rim of the makhtesh where the river exits the mountain and the colored sandstone. The panorama shows more of the makhtesh but to really experience it you need to go the Negev. The technical details – the photo above was taken with a Nikon 5300 digital SLR camera in February 2016 (ISO 400, 44mm, F11 at 1/400 sec). The panorama below shows more of the expanse of the makhtesh and was taken with my iPhone 6s, the exit is the dip on the left. I’ve printed this image as a large (40x150cm), high-quality inkjet print. This entry was posted in Nature, Negev, Photography and tagged crater, geology, makhtesh on October 2, 2016 by Shmuel Browns. In January it was kalaniot (red anemones) in bloom, now in April it’s poppies. I am always happy to take you exploring nature sites in Israel. This photo was taken in Emeq HaEla. The technical details – the photo was taken with a Nikon digital SLR camera in the afternoon (ISO 200, 35mm, F10 at 1/250 sec). Clicking on the image will display it larger. 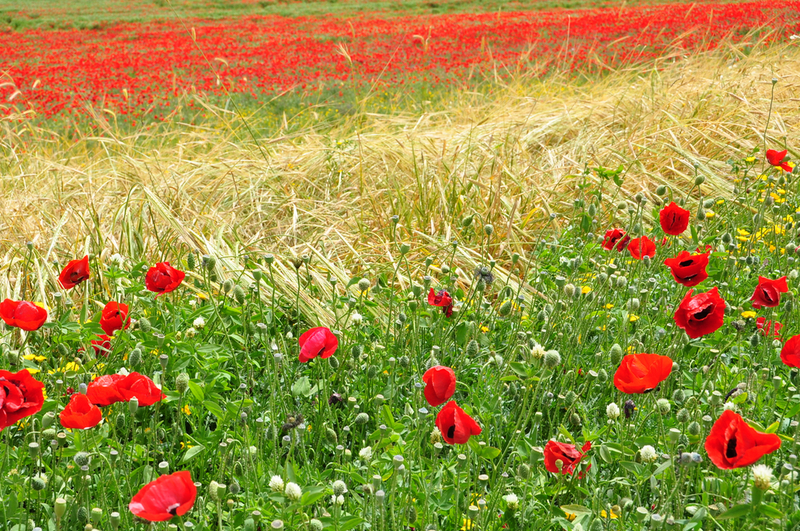 This entry was posted in Nature, Photography, Wildflowers and tagged photo of week, poppies, wheat on April 10, 2016 by Shmuel Browns.